Loading cattle from the paddock to the truck or back again is easy when you have high-quality cattle loading ramps set in place to facilitate a smoother flow of stock. When you need the very best cattle loading ramp for sale in Australia, you can count on Ace Equipment to deliver cattle loading ramps of a superior standard. 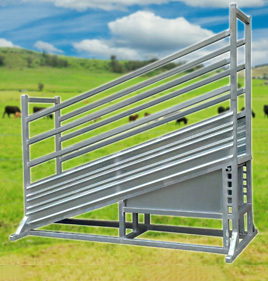 Fully adjustable and manufactured from heavy duty stainless steel, our cattle ramp comes in curved and straight pieces so you can create a path that cooperates with the natural movement actions of your livestock while still allowing for an efficient loading process. Our cattle loading ramps have been designed with safety first and foremost in mind, both for the stock and for yourself. They also allow easy access so you can move in and out of the enclosed area with minimal hassle or disruption to the stock. Ace Equipment is Australia’s premier supplier of cattle loading ramps. To place an order or to obtain further information on our cattle loading ramps, get in touch with us by calling 0437 014 327 or emailing sales@aceequipment.com.au.